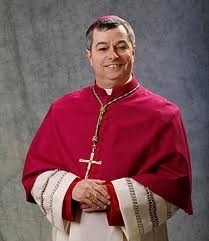 My Bishop, William F Medley of the Diocese of Owensboro, KY will be visiting the Seminary tomorrow. This is his first “official” visit to the Bishop Bruté, since we have started using it last fall for Sam and I. As part of his visit he will be our “Retreat Master” for the Day of Recollection that he will be preaching. Sam and I are quite excited to host him. On our Saturday morning Mass the Schola will be singing Bishop Medley’s “Episcopal Motto” song Holy is Your Name. Please pray for a fruitful Day of Recollection as we prepare to enter the Great week of Holy Week. ← Disabled People ARE Worth Something!